Harley had to leave us on the 20th of September, after a brief illness and losing the use of his hind legs. He was 15 years old, and lived with us for the past nine years. He was truly one of the gentlest and sweetest souls we've ever encountered. He was the darling of 11th Street in Park Slope and spent time each summer swimming and fishing in Echo Lake, in Maine. He was fascinated by the fish and would stand for long periods of time just watching and hoping to catch one -- just like any other fisherman. 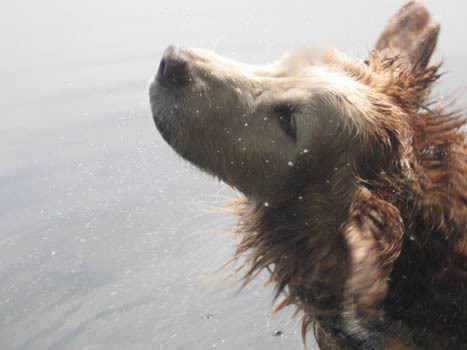 Even in his last summer, prior to his 15th birthday he swam to his heart&apos;s content. To quote our friend Anne Marie, "His leap out of the car--even this summer -- when he saw the lake and knew he had arrived at his summer camp always brought a smile to our faces." Thanks for sharing your time here with us Harley. We&apos;ll remember you forever.